If a technological feat is possible, man will do it. Almost as if it's wired into the core of our being. 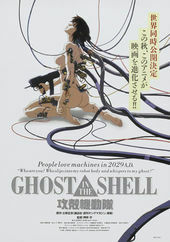 A classic upon its release, the title sequence to Ghost in the Shell is a curious mix of 8-bit type animation, then-hi-tech CGI, dreamy anime and naked torsos, all set to composer Kenji Kawai's intimidating, minimalist score. It follows the construction of a cyborg from the inside out, first embracing a cold, tech-heavy aesthetic as the robot’s inner-core is assembled, feathering into softer imagery and warmer colors as the cyborg takes on a more human form, soon emerging from the mechanical womb as a young woman.